Click on the image or arrows above to navigate. 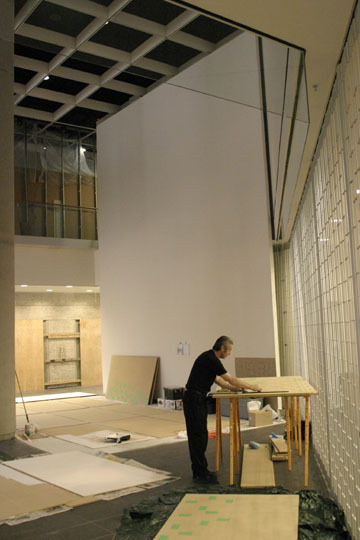 The photograph above, taken by William Eakin, shows Cliff Eyland masking out a panel in advance of attaching over 1000 mixed media works to the 24'x28' blank Winnipeg Library wall shown behind him. 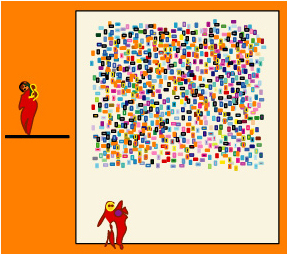 Each of Eyland's works measures 3"x5" (12.7x7.6 cm), the size of a standard library file card. The works are made on various thicknesses of paper, Masonite, canvas board and MDF and were white-glued directly to MDF substrate panels which were in turn attached to a plywood substrate/wall with black screws, the heads of which are visible in the final work. New works as well as examples of Eyland's past production were included in this installation. MDF substrate panels shown in the foreground have already been masked off with green tape before being painted white. Blank MDF panels are visible on the floor in front of the wall above. This website/CD-ROM publication is meant to be employed like a bird watching manual. A fixed set of binoculars has been installed in the Winnipeg Library and 30 sets of hand-held binoculars have been provided for patrons to borrow for viewing. Library patrons are also encouraged to bring their own binocular sets to view works that are higher up on the wall. Above is an early proposal drawing for the wall. After much discussion it was decided to build an entire wall of MDF board over a plywood substrate on the existing wall and to double the number of works attached to it from 500 to 1000. Special thanks: Craig Love, Janet Rothney, William Eakin, Trish Wasney, Adrian Shiminoski, Jones Miller, Pam Perkins, Richard Dyck, Mike Brown, Doug Lewis, David Kressock, John Patkau, Kevin Sim, Doug Marks, Rick Walker, Arthur Cohen, Jack MacGregor, Robert Epp, Winnipeg Arts Council.